These are the words Our Lady said to Saint Bernadette Sobirous, when asked by the young saint who she was. This was in 1858, four years after Pope Blessed Pius IX proclaimed the dogma of the Immaculate Conception, with the bull Ineffabilis Deus, December 8th, 1854, proclaiming that the Mother of God was preserved from all stain (macula) of original sin, by the merits of Christ which God saw (praevisa) beforehand. In other words, she was saved before the Saviour took flesh from her, as a unique and unrepeated privilege. but God chose what is foolish in the world to shame the wise, God chose what is weak in the world to shame the strong, God chose what is low and despised in the world, even things that are not, to bring to nothing things that are, so that no human being might boast in the presence of God. Mary’s parents, whom tradition names Joachim and Anne, were, by tradition, pious and devout, elderly and childless. 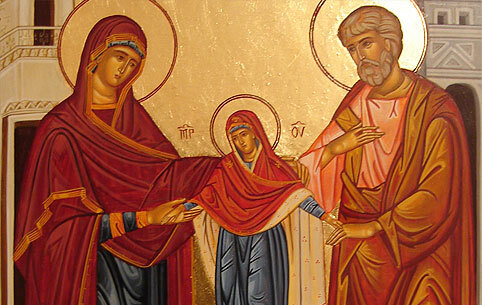 As is often His wont, God chose this unlikely couple to conceive, in a miraculous way, the future Mother of God, a fitting abode for the Word Incarnate. At the shrine of Saint Anne at Beaupre, just north of Quebec City, there is diplayed in a glass case, the forearm bone of the grandmother of Christ, making all of this sort of unsettlingly real and, well, incarnate. God really does work through real flesh and blood, in all of our own human-ness and limitations. Out of these, He can do wonders. So we should rejoice in our humility and lowliness, and hope even in the midst of impossible odds. Of course, the modern world would discount such notions as an ‘immaculate conception’, even doubting the existence of such things as a a human ‘soul’, smiling perhaps politely at such follies, mired in their materialism. Oh well, let the world revel in its apparent and all-too-temporary power, pomp and splendour, which will quickly pass away. The real things, like souls, immaculate and otherwise, will endure. We should hope, trust and even boast only the providence and power of Almighty God, which acts often when and how we least expect. My soul proclaims the greatness of the Lord, and my spirit rejoices in God my saviour. Next articleIs Beauty in the Eye of the Beholder?